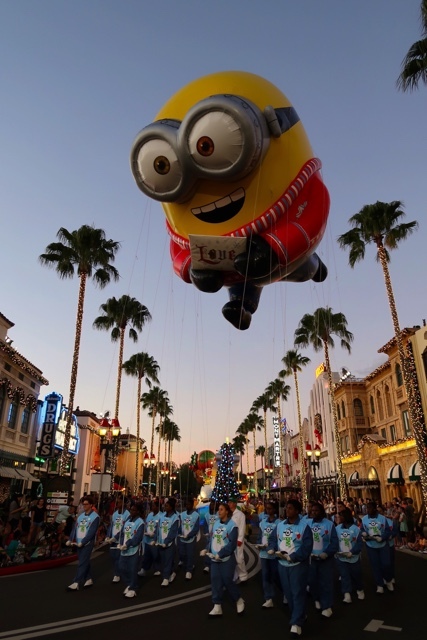 The Universal Orlando Resort celebrates many events and festivities throughout the year. From Halloween with their Halloween Horror Nights to Mardi Gras hosting the largest Mardi Gras Celebration outside of New Orleans. 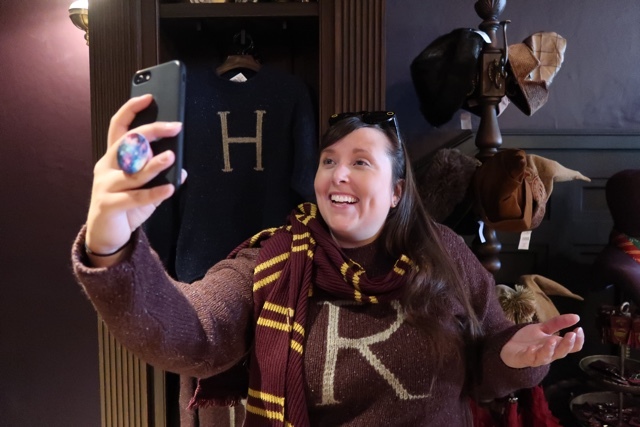 They also have a special celebration for all things Harry Potter with their Celebration of Harry Potter festivities that take place each January. All of those are of course well done, however after just celebrating the holidays at Universal, I think it might be my favourite celebration of all. First of all, celebrating the holidays in a warm climate is a bonus for me. But also celebrating the holidays with everything from the Minions to the Grinch, and the Wizarding World of Harry Potter? What more could you ask for? 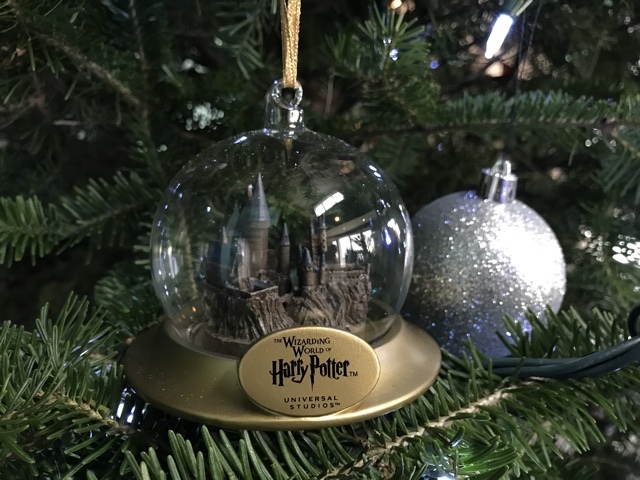 If you are thinking of visiting and celebrating as well, then check out below for my best tips for celebrating the holidays at Universal Orlando. At Universal it is always a great day for a parade. Literally. They have parades every day! During the holiday season not only do they have their Superstar parade every day around 2pm, but later on in the day they also have a holiday parade featuring Macy’s. (check HERE for times). The parade has a bunch of great floats, HUGE Macy’s balloons, dancers on stilts and a lot more. 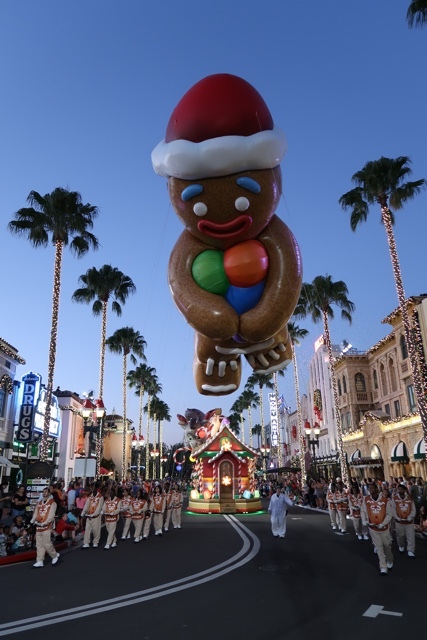 The parade features many characters from Universal like the Minions along with Gru and family, Shrek and friends, everyone from Madagascar and you can’t forget the most important person of all, Santa! My best tip for seeing the parade is to grab a spot along the main streets in Universal Studios at least 30 to 45 min ahead of time to get the best spot. The parade begins (and ends) right across from Mel’s Drive-in by the Pantages Theatre. It then heads down Beverly Hills towards the park entrance, then makes a right on to the main strip going past The Minions and Jimmy Fallon’s Race Through New York, before turning right again into the New York area and then right again to finish where it started. My favourite spot to stand is in the Beverly Hills area of Universal Studios right across from the Brown Derby Hat Shop so the parade almost comes straight at you. It is also neat to see it in the New York area because of course it looks like you are in New York. Where ever you stand you are sure to get a great view and have a great time watching the parade and enjoying the festive music, confetti and even snow! Say “Hi” to Santa for me! A fun thing that you can do when visiting Universal (especially if you have kids or are just young at heart like me) is to go to a character breakfast. You can enjoy breakfast while hanging out with Sponge Bob Squarepants, the Minions, Dora the Explorer and all of their friends. Just announced you can also now have dinner with some of your favourite super heroes too like Captain America, Spiderman and Wolverine. During the holiday times you can also have breakfast with the Grinch and celebrate Grinchmas at the Grinch and Friends Character Breakfast. Located in the Circus McGurkus tent in Suess Landing, get ready for one wacky breakfast. Enjoy Cindy Lou Who cinnamon buns, Thing One and Thing Two coloured donuts, and for the brave Green Eggs and Ham pizza. 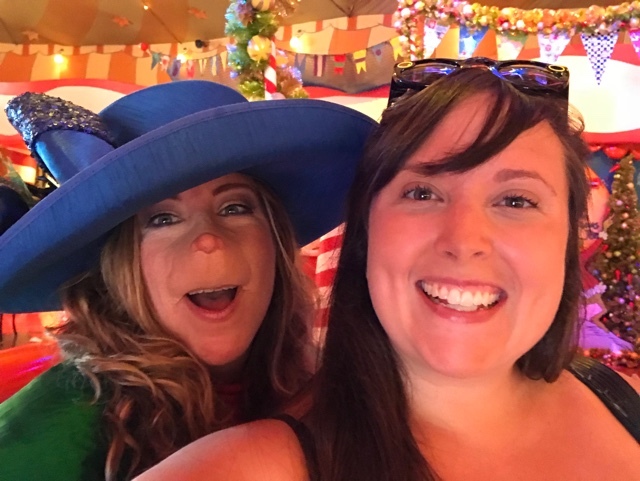 While dining you will also get the chance to meet many Whos from Whoville as well as the Cat in the Hat, Thing One and Thing Two and even the Grinch himself will stop by for a visit. Islands of Adventure typically opens at 9am but if you have a character breakfast scheduled you can enter the park early to go to that and this can help maximize the time that you have to spend in the park that day as well. 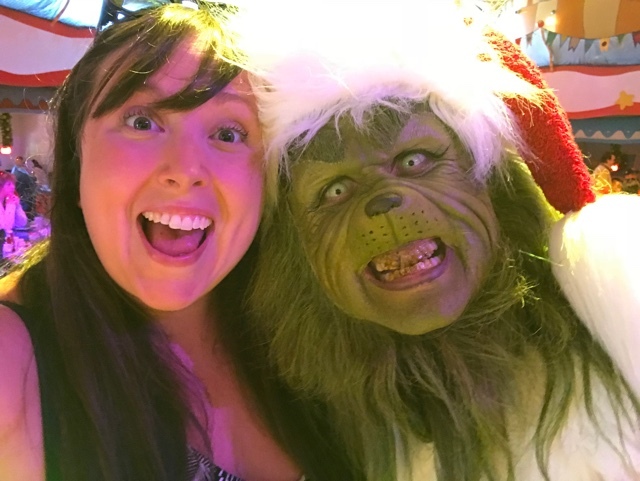 Make sure you make a reservation ahead of time and have your cameras ready for the Grinch! Side note: Staying at an onsite Universal hotel also gets you early entry in to the park! 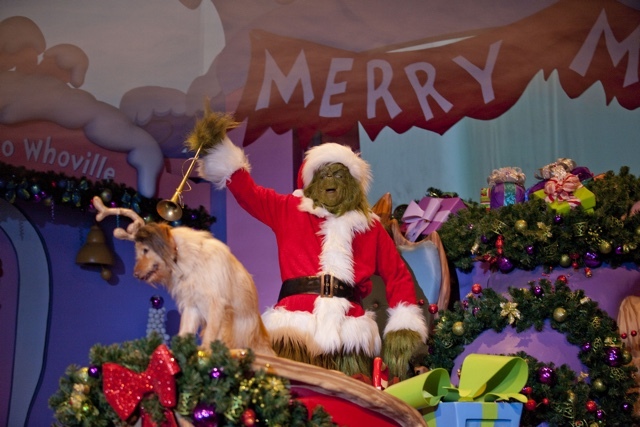 Watch the Grinchmas Who-liday Spectacular! If you aren’t all Grinch-ed out after your Grinch and friends character breakfast then you should definitely check out the Grinch’s Who-liday Spectacular show afterwards. A live retelling of the Grinch story we all know and love with the Grinch, a bunch of Whos from Whoville and even his lovely dog Max might make an appearance. There are multiple showtimes every day. For the 2017-18 season Christmas has come to the Wizarding World of Harry Potter for the first time ever! 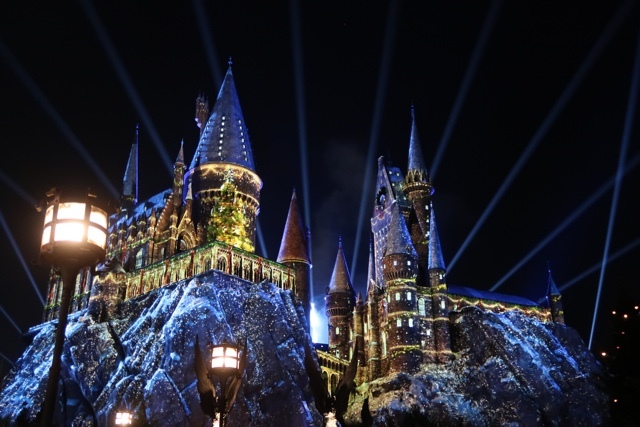 The biggest, most exciting part about it is the Magic of Christmas at Hogwarts projection mapping show that wraps all of Hogwarts in a magical 7 minute light show. Featuring fireworks, large snow men, Christmas trees, the Yule Ball, advertisements by the Weasley brothers and more, it really is a sight to see. The show takes place roughly every 20minutes starting at dusk until close. My favourite spot to stand was about halfway between the castle and the Frog Choir stage for the best views. I also recommend watching it at least twice as there is so much happening you will see different things each time. 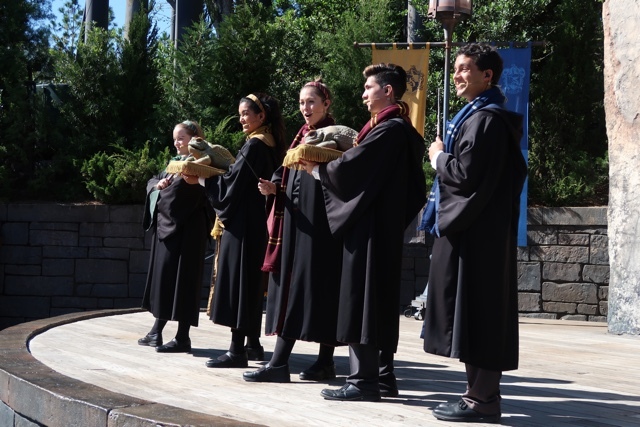 It is a truly magical experience especially for Harry Potter fans. 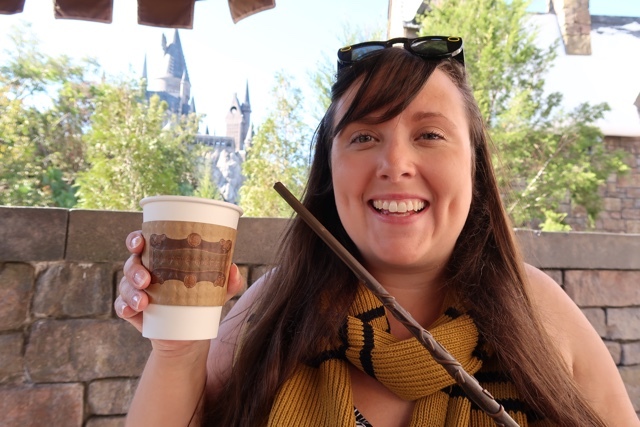 Year round in the Wizarding World of Harry Potter you can drink tasty ButterBeer served in the regular way and as a frozen option. You can also find ButterBeer flavoured ice cream, and even ButterBeer flavoured fudge! During the holiday / winter season at Universal you can also try Hot ButterBeer which might now be my favourite way to have it. Hot ButterBeer isn’t served at the ButterBeer carts, to get it you must order it at the Leaky Cauldron restaurant, the Three Broomsticks or the Hopping Pot. It is so delicious and will warm you up on a cool night during the holiday season. 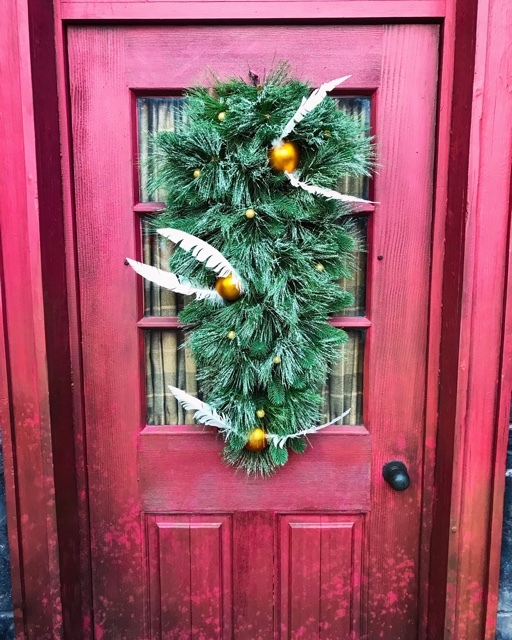 One of the coolest things about the Christmas celebrations in Hogsmeade and Diagon Alley is all of the detail. At first it just looks like pretty garlands, lights and wreaths but when you get up close you realize that it is a whole lot more. The Honey Dukes candy shop has wreaths and garland that are full of candy pieces. The Quidditch shop has decorations full of golden ornaments that have feathers attached to them to make them look like golden snitches. 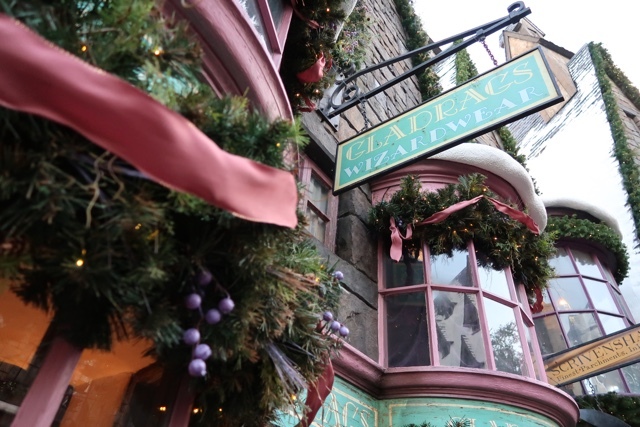 Gladrags Wizardwear has decorations that are decorated with pink ribbon, the same that was used to make Hermione’s Yule Ball dress. Universal did an excellent job decorating and really brought Christmas to life in the Wizarding World. If you get a chance to take the Hogwarts Express from Digaon Alley to Hogsmeade you will also notice that Kings Cross Station is full of festive muggle decorations as well. 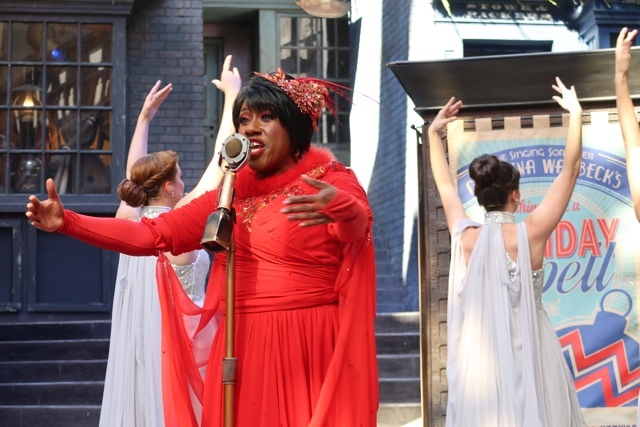 Year round the Frog Choir performs in Hogsmeade and Celestine Warbeck and the Banshees perform in Diagon Alley. During the Christmas celebrations they both have a new show filled with performances and holiday songs all about getting a Hippogriff as a Christmas present, The Most Magical Yule Ball of All, and a bunch more including Accio Christmas that is stuck in my head forever… There is no better way to ring in the holidays then singing Harry Potter Christmas songs am I right? The Frog Choir and Celestina both perform about 6 times a day throughout the late morning and afternoon. Show times can vary by day and weather, find them listed HERE. All throughout Universal there are plenty of gift shops great for buying holiday presents for your friends and family. Great items include Jurassic Park t-shirts, banana hats only a Minion would love, Jimmy Fallon’s tight pants and so much more. During the holiday season you can also find lots of holiday themed presents as well. Many gift shops carry funky Grinch Christmas hats and Christmas themed presents. You can also find Harry Potter Christmas stockings, scarves, Hogwarts ornaments and more. You can even buy itchy knitted sweaters made by Mrs Weasley herself with a big H or R on the front for Harry and Ron. If you don’t get to visit Universal Orlando during the holiday season don’t fret. Year round in Islands of Adventure you can also find all things Christmas related at the Port of Entry Christmas Shop. 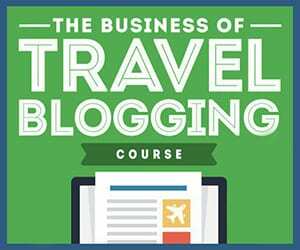 If you need a holiday break while visiting during the holiday season don’t worry. Christmas isn’t celebrated everywhere, head on over to the Simpsons for a Duff beer to relax or to Jurassic Park for a scary raptor experience holiday free. 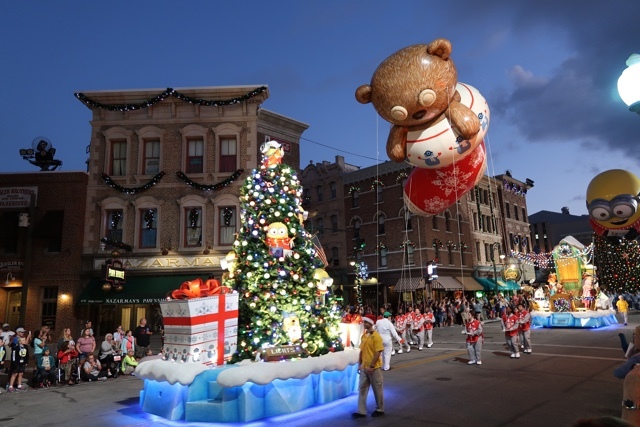 Would you ever celebrate the holidays in a theme park like Universal? I definitely recommend it! Follow my tips and you will have a wonderful time! Happy Holidays!